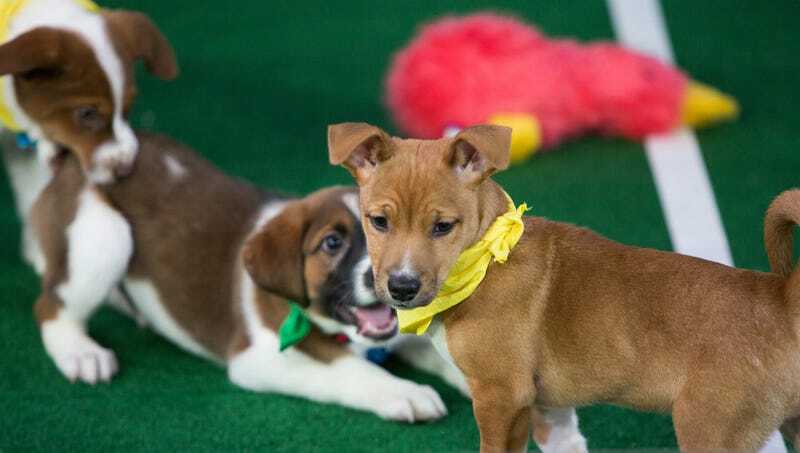 BIRMINGHAM, AL—Blaming the punishing physical toll the game takes on their bodies, an alarming report released Sunday by the National Center for Sports Safety revealed that 78 percent of Puppy Bowl participants die before reaching the age of 50 weeks. “Our data confirmed pugs, cocker spaniels, and huskies that participate in the Puppy Bowl rarely live to see 50 weeks,” said lead researcher James Henderson, noting that after 35 weeks, many former Puppy Bowl competitors no longer recognize the people rubbing their bellies, and simple acts like standing on their hind legs can cause excruciating pain. “Because these young canines are exposed to such brutal hits, by the end of their lives, most Puppy Bowl players can barely roll over, let alone chase around a sock. Many are in agony even when they are just gnawing on a squeaky toy. It’s devastating for families to watch former stars like Beebop and Wilma pass away in what should be their prime.” At press time, Puppy Bowl officials were denying any attempts to bury a previous study about the connection between hits on defenseless retrievers and peeing on the carpet.